I remember when my babies were born, their skin was so soft I didn’t even want to give them a bath because I was worried their delicate skin might be damaged. Of course I did in the end, but was very careful about what I used to wash them. So for my next baby I think I may give this new range a try. 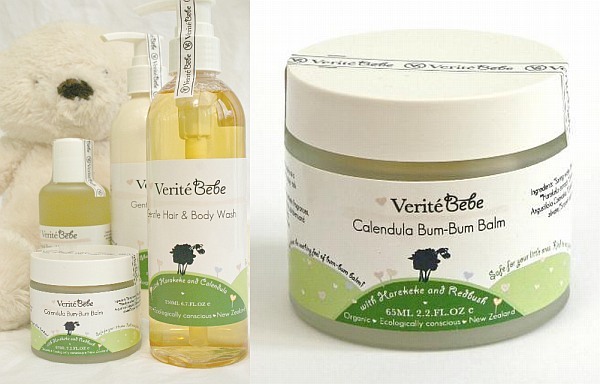 Verite Bebe is part of an organic spa range created by Kiwi mum Janin Dei-Conti that are free from chemicals and additives. Made using mostly certified organic ingredients (a small portion are organic but not officially certified), Janin says Verite Bebe is particularly good for baby eczema and can be used from birth. All handmade in New Zealand, chose from baby wash, lotion, massage oil, the delightfully named bum-bum balm and even a mozzie repellent. Prices are reasonable too, starting at NZ$10 up to NZ$95 for one of the larger gift sets. Janin has some great offers for Christmas so check out her online shop.